Le Cache Model 2400 Wine Cabinet Classic Cherry (P/N 734). Clean, contemporary design blends equally well with modern, Craftsman, Deco or Asian decors. Hardwood doors and gently arched windows showcase fine wine collections. Sealed seams, premium insulation and tinted double-paned glass provide thermal and UV protection.These options are included in the price of your wine cabinet. Great wine rack. This is a piece of furniture that I have in my dining room. Holds 286 bottles of wine. Keeps wine properly chills and doesn't make a lot of noise. I've now had my LaCache for a little over a year. The only negative is that it's noisy. But outweighing that is the fact that it's a beautiful wine refrigerator that looks great, is very well made and stores my wines perfectly. Steven, thank you for your review. The cooling unit that you ordered with your cabinet is our 1800XT, which is our most powerful (and noisiest!) cooling unit. For this reason, we recommend this unit for garage installations. If your cabinet is installed inside the home, and you would like to switch to a quieter unit, please let us know and we'll be happy to accommodate you! Actually, the unit is in our garage, so it’s not a problem. Seriously, that was my only complaint….otherwise I love the unit! Thank you for your review. It is not unusual for the air temperature inside the cellar to rise 4 degrees after 20 minutes when the wine cabinet is empty and/or as ambient temperatures rise. It is important to fill the cabinet with thermal mass - wine bottles, cans, etc - so that the cooling unit cycles on and off for longer periods of time. Another option to extend the cycles is to use a bottle probe, and cycle the cooling unit based on liquid temperatures instead of air temperatures. We look forward to speaking with you on Monday! Beautiful, well-built piece of furniture. Delivery service was not as described though. Tough to beat great quality, quiet operation and superior customer service. The Le Cache wine cooler we purchased is beautiful and works great. It's very high quality from the cooling system to the doors and the racks. I would recommend these products to anyone that loves wine and wants to store it in an ideal enviornment that's also a great piece of furniture. The cooling system is somewhat noisy. Our unit is in our dining room and when we entertain I will likely shut off the unit. PS..... I do love the unit though, and it is beautiful! The gentlemen who delivered the unit were professional. I am disappointed with the $40 carpet board I purchased from you that was placed under my unit. The unit was place on the board and then pushed against the wall. However, the unit was not plugged in. I had to move the unit, take out the plug/wire, replace the styrofoam and then, with my two sons, replace the unit on the board and place it against the wall plugged in. This would have been impossible if I was elderly or didn't have my sons home from college to help. The unit should have been on a wider wood board, plugged in and running before the delivery men left our home. Very pleased with my 2400 series cabinet and the service received upon purchase. I recommend this company and this product. Purchased about one year ago. Will be purchasing another, but bigger model soon. Delivery was perfect. The fit, finish and quality of the unit is very good. Great product and great service translates to great value. Compared to other manufacturers, Le Cache has distinguished its products. Highly recommended. This is my second 2400 - first time for this cooling unit. Website easy to navigate. Clear classifications of products. White glove service excellent - worth the premium. The cabinet is beautiful and the entire buying process was first-class from advice on space issues to delivery. The cabinet is wonderful – I was not sure how the delivery guys were going to manage such a heavy piece, but they managed to do a great job. They were very good – not a scratch anywhere. The cabinet is working beautifully. I followed your instructions carefully. I now have several cases of wine inside, with more coming to be stored in the cabinet. The cabinet is absolutely gorgeous and very well made. I was happy with your help and the delivery service. I will recommend your product to friends. Delivered in good condition and so far it is working fine. Looks good also! Service and product exceeded my expectations. Outstanding! I was more impressed with the wine cabinet once it got here! What a wonderful treasure. Le Cache personnel were terrific, honest and most incredibly helpful. My wine cabinet is nearly full! You can be sure my next wine cabinet will be a Le Cache! I'm extremely pleased with the wine cabinet and was very excited to fill it up! After much research, I decided on Le Cache for an affordably beautiful wine cabinet. What a fine cellar. I can hardly wait to stock it! As the third compressor in as many years started to fail in my existing wine cabinet manufactured by someone other than Le Cache, it was time for me to begin a search for a replacement. After extensive research comparing all price points it became apparent Le Cache offered one of the best price to value relationships. In addition they were one of few who even offered an upgraded compressor. After speaking directly with Le Cache and having all of my questions answered I proceeded with the order. Even though the lead time for my model 2400 cabinet was 2-3 weeks due to high demand, Le Cache expedited my order so as not to risk damage to my existing collection. Order entry was simple and the tracking links worked perfectly and the delivery and setup went without any problems as well. 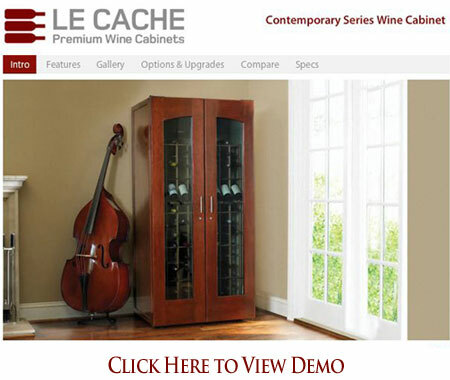 In this day and age where customer service is virtually non-existent, Le Cache hit all the notes and I would highly recommend both the product and the staff to any individual in the market for a wine storage unit. We feel the personal contact with Le Cache was very reassuring and more than helpful. Great product. We're thrilled! A wonderful and professional job from construction to delivery. A beautiful piece of furniture that is also a great wine chiller. Thanks for the awesome craftsmanship. You have a great product and your customer service is excellent. Thank you again. [If you are a prospective purchaser. you should] personally inspect the competition - you'll select Le Cache. I'm extremely impressed with my overall experience of purchasing my wine cabinet from Le Cache. Your product/service has been nothing short of exemplary. I was extremely impressed by the overall experience. from the first telephone call until the delivery. Thank you for your responsiveness and excellent customer service to work through delivery issue. Turnaround time from purchase to delivery was so much appreciated (1 1/2 weeks). The Model 2400 is spectactularly beautiful. solid and a magnificent piece of furniture! It is quiet. and universal racks are outstanding. The people I talked to were wonderful. Racking size is the best of all brands looked at. It enables even the largest bottles to be stored without any hassle. The open ends of the racking also make removing bottles very easy. The unit is a bit louder than I was expecting, but my dB meter shows less than 50 dB from six feet away, 60 dB right against the wall next to the cabinet. I have the unit stocked about 80%, 50/50 wine and liter water bottles. This water thermal mass was added today, so the unit is running a bit more frequently at present, hopefully on its way to far less frequently! Thank you for making a wonderful product! It is stunningly beautiful! Greatly appreciated the personal attention from the owner... We felt very confident with our decision. Thanks for a great unit. Thanks for a great unit. Has received praises from all who have seen it.